Bronchitis. The Lung Association website. Available at: http://www.lung.ca/lung-health/lung-disease/bronchitis. Updated November 18, 2015. Accessed March 14, 2018. COPD. EBSCO DynaMed Plus website. Available at: http://www.dynamed.com/topics/dmp~AN~T115557/COPD. Updated February 12, 2018. Accessed March 14, 2018. 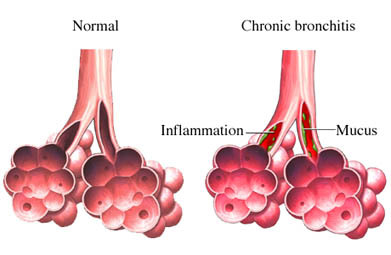 Chronic bronchitis. Family Doctor—American Academy of Family Physicians website. Available at: http://familydoctor.org/familydoctor/en/diseases-conditions/chronic-bronchitis.html. Updated June 2017. Accessed March 14, 2018. Explore bronchitis. National Heart Lung Blood Institute website. Available at: http://www.nhlbi.nih.gov/health/health-topics/topics/brnchi. Accessed March 14, 2018. Explore COPD. National Heart Lung Blood Institute website. Available at: http://www.nhlbi.nih.gov/health/health-topics/topics/copd. Accessed March 14, 2018.